After looking at the crash of 1987 through the lens of a macro trader, I thought it would be interesting to examine how a bottom-up stock picker navigated the same environment. Who would be a better example than legendary hedge fund manager Julian Robertson. The Outstanding Investor Digest published excerpts from his letters in 1987, allowing us to follow him through the stormy year. Robertson started working at Kidder Peabody in 1957 and left for a sabbatical in 1978. He started Tiger in 1980. By early 1987, he had created a remarkable track record. He entered the year bullish and invested in small caps. He believed Japanese market was in a bubble, which he expected to fuel the U.S. market in the near term. Japanese investors would recognize the valuation discrepancy and divert some of their funds to the U.S. The lower dollar was also a key reason for his bullishness. The year started off well and the fund was up about 20% by March. Robertson illustrated the excess of the Japanese bubble to his investors. Nippon Telephone & Telegraph, for example, “sells at about 250 times earnings” and exceeded the stock markets of nations like Germany and France in value. In the summer of 1987, Robertson further bolstered his shorts exposure by making a strategic investment in The Polar fund, a short fund run by his friend Gilchrist Berg. 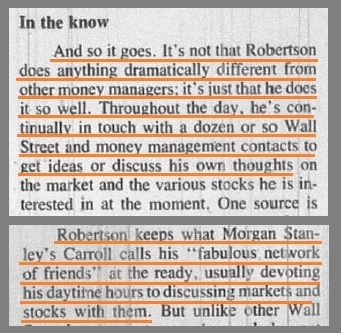 Through the investment, Robertson gained both direct short exposure and early access to short ideas for his own fund. As of the end of the third quarter, Tiger was up 13.9% as compared to the S&P 500 at 6.5%. Robertson was pleased as the fund was only about 80-85% net long on average. 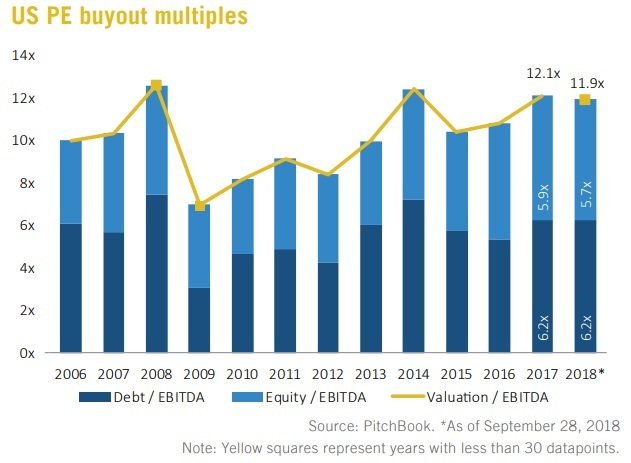 He believed that the market would continue to benefit from foreign buyers, Private Equity buyouts, and greater equity allocations by pensions. He noted growing bearish sentiment and hinted at the use of portfolio insurance by investors who were afraid of a severe decline. His own investors seemed to share this negative sentiment as they reacted very positively to the investment in the Polar short fund. We know what happened next. On October 19, the Dow Industrial fell 508 points, or 22.6%. The combined losses of Monday and the preceding Friday were 30%. By market close on Monday, the market had erased all of the year’s gains and showed a year to date loss of 8.3%. A few weeks later, in his November 10 letter, Robertson broke the bad news: the fund had declined 30% from September 30 to October 31. The fund was concentrated in small caps when the market experienced a flight to quality. Tiger was short the Japanese market, expecting it to break first. But Japanese stocks performed better than U.S. stocks. The fund was leveraged which was costly to unwind in the chaotic market environment. Tiger cut back its gross exposure from around 250% before the crash to 162% (115% long, 47% short). Robertson continued to be bearish Japan, which he called “absurdly overvalued.” A bursting of the Japanese bubble was the key risk he saw for global markets. Robertson did not try to make excuses for the poor performance. He examined and explained what went wrong. He reduced leverage. Then he focused on what to do going forward. 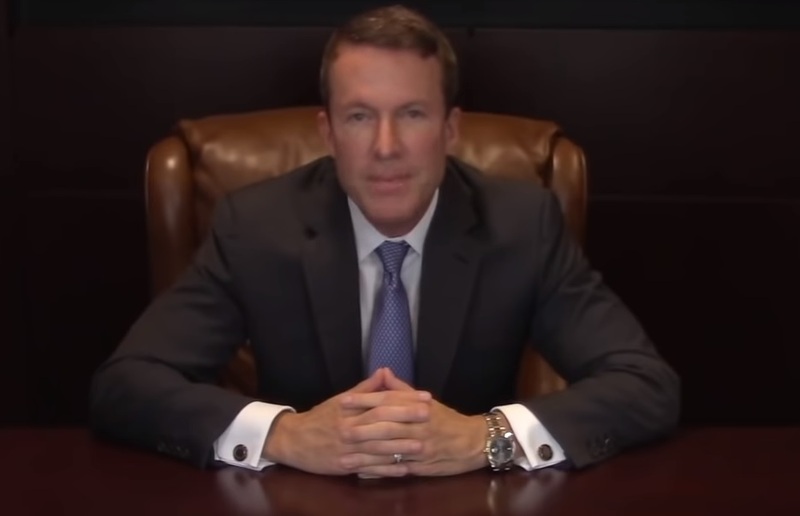 Robertson took a defensive stance and lowered his fund’s leverage. But there was no change in strategy, no new big macro bet. He talked to his contacts in Corporate America for an update on the economy. Then he carried on with his bottom-up approach of investing in the stocks that he thought offered the best risk-reward. Only a couple of months after the most dramatic loss of his career, Robertson talked about “one of the major buying opportunities of our time.” There was a lot of blood in the streets and he was ready to buy. He told his investors that raising more cash was exactly the wrong thing to do in a world awash with bargains. I think the single most important question is: would you have redeemed from Tiger? Imagine the market crashing tomorrow. Your favorite hedge fund manager tells you he was ill-positioned and underperformed, despite being short. This is the guy who was supposed to protect your capital. And while plenty of people are turning bearish around you, he wants to double down. Would you stick with him? And why (or why not)? Julian Robertson created an exceptional track record. But not without experiencing vicious drawdowns. Could you maintain conviction through that kind of volatility? Tiger Management 1987 investor letters as reprinted in Outstanding Investor’s Digest. "You can think here. You don't hear so many stories. You can just sit and look at the stock on the desk in front of you." Reading these quotes, I feel a temptation to flee New York. An urge to retreat to a chalet in the Alps or a cottage on a hidden beach in the Caribbean. Unplug from the internet and read, think, and write all day. After years of living here, I crave quietude. Living in any financial hub, you have to deal with another kind of noise. You are surrounded by people who are “in the business.” They are driven, ambitious, competitive. Always looking for the next insight or idea. Always pitching, selling, connecting. There is a constant conversation, an energy driven by market volatility and the hunger for growth. Will this market hold the support? What do you think of European equities into 2019? Are the homebuilders a buy here? Did you see that Insert Name Capital just went activist on Random Corp of America? And what about China? Hey, let’s set up a meeting with Yet Another Fund LP. Trust me, you’ll like those guys. You get bombarded with information and sales pitches. The days are never quite long enough to deal with it all. Just one more meeting, just one more presentation. Being plugged in can leave you exhausted and distracted. If you want to do fewer things, being exposed to fewer things seems like a sensible first step. So, should investors all pack up their Bloombergs and run their portfolios from a trailer in the Rockies? These great money managers practiced a seemingly opposite approach. They plugged themselves into the flow of information at the heart of the market. They built their businesses around their networks. Not only to source new ideas, but also to get valuable feedback on their own thoughts. “From the beginning of his career he had worked very hard at establishing a network of people around the world who he could turn to for information about potential investments and who he could use as a sounding board before he made investment decisions. George Goodman: Some of the great investors do better out of New York. John Templeton lives in his flower garden in the Bahamas and Warren Buffett lives in Omaha, Nebraska. And both of them say that living out of New York keeps them out of everyday gossip and the hurly-burly of flow and overload of information. How do you survive in New York? Are you an original thinker or a derivative thinker? I think most of us are both, but with one side being dominant. That is your job. To create the conditions in which you can do useful work. You have to be thoughtful about choosing an environment that supports good habits and suits your personality. What environment makes you happy and productive? In my mind, that means balance. I may feel like retreating to the mountains for solemn reading and contemplation. But if I spent my entire year there, I would leave myself isolated and lonely. And let’s remember that even though Buffett physically removed himself from Wall Street, he worked hard to build and maintain a valuable network of friends and contacts. From Alice Schroeder’s Snowball: staying in touch with his friends in New York and elephant-bumping (at the annual Sun Valley conference and at Kay Graham’s Washington DC parties). In March 1959, Warren took one of his regular trips to New York, staying out on Long Island at Anne Gottschaldt’s little white colonial house. By now she and her sister had adopted him as a sort of surrogate son, as if to replace the long-dead Fred. Warren kept spare sets of underwear and pajamas at her house, and Gottschaldt made him hamburgers for breakfast. On these journeys, he always set out with a list of between ten and thirty things he wanted to accomplish. He would go to the Standard & Poor’s library to look up some information. He would visit some companies, visit some brokers, and always spend time with Brandt, Cowin, Schloss, Knapp, and Ruane, his New York City network. He developed a network of people who—for the sake of his friendship as well as his sagacity—not only helped him but also stayed out of his way when he wanted them to. I will close with the full quote from Supermoney. Buffett very deliberately chose his environment and built a balance in his life that worked well for him. Time to Hit the Panic Button? After a sharp decline in October, is it time to stick a fork in this bull market? The last one is the one I care about. I would really prefer to watch that one from the sidelines. But as of right now, a number of indicators are not suggesting a turn in the economic cycle. 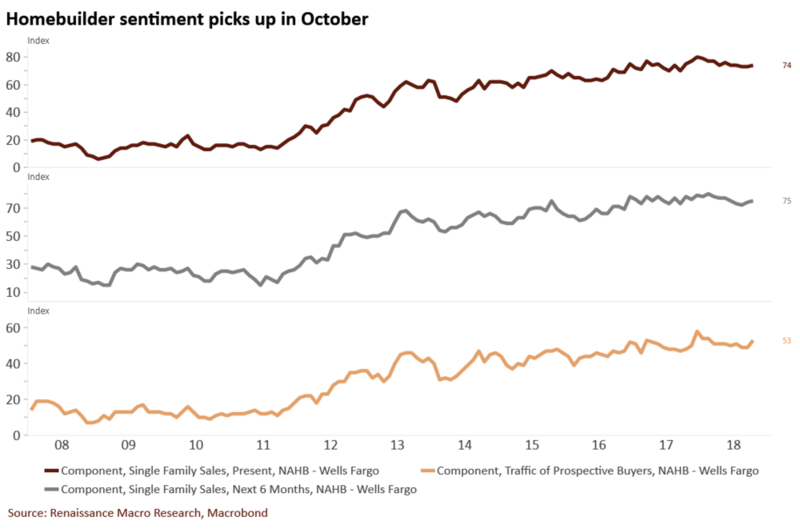 While housing-related stocks look terrible, homebuilder sentiment has held up. I think in October a multitude of worries hit the market at a time when it was vulnerable. That’s what they say in Germany. Sit tight and have a tea. It’s true, the sell-off was (is?) ugly and the market could well be leading the economic data to the downside. But we have also seen a “mini cycle” before during this bull market such as the energy-industrial recession in 2015/2016. If the economy cools from hot to mediocre, why wouldn’t the market take a breather. If we roll over into a full recession that’s another story. I will admit to being spooked by the recent market action, ugly charts in cyclical sectors, and weak global markets. The combination of Fed tightening, cooling global growth, and a continued trade war is concerning. But to me, this seems to early to call. If (when) domestic data deteriorates and the credit market starts showing stress, it will be time to re-evaluate. Of course by then the market could have taken a lot more damage. Just one last scary chart before we finish off. As always, feel free to email me or contact me on Twitter. What indicators do you look at? What sources and people do you trust to read the macro tea leaves? This is not investment advice! Do your own research and consult with your advisors. In 1959, Fortune published an article called “A New Kind of Stock Market.” The Dow Jones had risen by 34% in 1958 and for the first time in 25 years, the stock market’s dividend yield had declined below the yield on long-term bonds. Market sentiment was still influenced by memories of the Great Depression and investors were looking for income and safety. Stocks, being riskier than bonds, were expected to provide a higher yield. With the dividend yield below the bond yield, was the market headed for another crash? But stocks did not fall. There was no major readjustment. Instead, the economy kept expanding, earnings kept growing, and the 1960’s brought the first speculative bull market since the 1920’s. Meanwhile, bond yields were just beginning their ascent. The “article of faith” stopped working. Today, nobody argues that the stock market should yield more than the bond market. But other indicators are being used as rules of thumb to judge whether the market may be at an extreme. Typically, these charts show a compelling and simple relationship that appears to identify cyclical market peaks and bottoms. I will touch on a few of the charts I encounter on a regular basis. My point is not to argue whether the U.S. stock market today is expensive or not, but merely to point out flaws in these indicators that suggest an easy answer. “The ratio has certain limitations in telling you what you need to know. Still, it is probably the best single measure of where valuations stand at any given moment. This measure has since become known as the “Buffett Ratio” (most charts use GDP instead of GNP, hence the different percentages from Buffett’s quote). One obvious issue with this ratio is that it compares companies with increasing international exposure to domestic economic activity. Another potential issue revolves around higher corporate profit margins. While profit margins fluctuate with the economic cycle, changes in industry composition and industry concentration could be elevating margins long-term. Another type of chart I encounter in conversations about asset allocation compares the valuation of the U.S. stock market to international peers (often the ACWI ex-US or emerging markets). Over the chosen time frame (1995-2018) the message seems obvious: the U.S. is historically expensive and it’s time to bet on mean reversion. Lawrence Hamtil discussed the flaw in this argument in his blog: aggregate market valuations are not directly comparable due to the differences in sector composition. The sub-industry composition can also be very different (for example, consumer discretionary can be weighted towards automotive components vs. internet retail). These charts compare the stock market with a commodity index. They seem to make a compelling argument: are commodities historically cheap and about to rally dramatically (or are stocks perhaps about to crash)? However, as Sri Thiruvadanthai pointed out, these charts are flawed as they compare a total return index (GSCI Total Return Index) with stock price indices. Many legendary money managers don’t like to share their views in public. It’s understandable: making a call opens you up to criticism and the potential embarrassment of a mistake. And an isolated comment could easily mislead the audience, since the manager may change his or her view and position at any time. When a manager of David Tepper’s acumen appears on CNBC, people tend to listen. But as the months go by, there is no answer to the question: “David was bullish at that price, what about now?” We only see the prediction and the outcome. Unless you receive a fund’s letters, or speak to the manager directly, you don’t see how they react to new information. This makes it difficult to really understand a manager’s process. I was excited when I learned that Paul Tudor Jones had participated in the Barron’s Roundtable for several years. In the wake of the 1987 crash, Jones sat down every January and shared his views on markets and the economy. We can peek over this legendary trader’s shoulder and watch him trade the U.S. and Japanese stock markets. One market was forming a massive bubble, the other merely looked like one. I don’t want to encourage anyone to adopt a global macro strategy, or to look for bubbles to short, or even to actively trade in general. Rather, I think of Jones’s extensive comments as a kind of case study. His principles have been studied by generations of traders. How does this episode illustrate his philosophy? What can we learn about his decision-making process? How did he implement his ideas? The year 1987 made Paul Tudor Jones famous as the man who had predicted the crash. Jones had started his firm Tudor Investment Corp. three years earlier after years as a commodity pit trader. 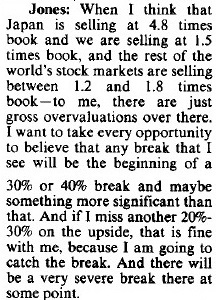 In the summer of 1987, he was profiled by Barron’s and discussed his bearish outlook on the U.S. stock market. Jones thesis rested on two key ideas. First, Jones used an “analog model” that his research director Peter Borish had developed. The model was an overlay chart of the stock markets of the 1920’s and the 1980’s and showed an “astonishingly robust” correlation. Jones also pointed to a chart showing the Dow Jones Industrial’s deviation from its trend. Prior spikes had occurred in 1836, 1929, and 1966 - all followed by bear markets. He observed that there was exuberance in other markets (for example, in fine art), and noted some troubling debt and economic statistics. In the article, Peter Borish admitted to “fudging the exercise somewhat by juggling the starting periods”. Nevertheless, the bearish outlook paid in spades on October 19. On the day of the crash, Jones covered his short position and went long bonds, expecting the Fed to ease financial conditions. That month he made 62%. After the crash, Jones did not shy away from publicity. He participated in the January 1988 Barron’s Roundtable and was also profiled by the Wall Street Journal in May of 1988. The Journal called him the “Quotron Man” who “swaggers through Wall Street with a flair worthy of the movies”. The article described his “rock and roll” trading style, his lifestyle, and his eye-popping returns: “last year he had a 200% return, mainly because he dumped stock-index futures just before the crash, then bought heavily while other money managers were still reeling.” It noted that Jones was focused on the Japanese stock market and thought it might trigger another wave of selling in the U.S. In 1988, Jones also sat down with Jack Schwager twice for his Market Wizards interview. Schwager noted that by the second interview, Jones had become worried about a potential “governmental witch hunt.” He feared that vocal short sellers would be blamed if the U.S. market declined further. Even in that interview, Jones balanced his long-term bearish view with a short-term neutral stance. Jones was wrong again in 1989 as the market made new highs. By January 1990, Jones was very bearish on Japan and feared spillover effects from its bursting bubble. He also described the U.S. economy as being “late in the business cycle” and noted an acceleration of inflation. He observed that short sellers were doing well in an advancing U.S. market. His interpretation was that the market internals were weaker than the index level suggested. Japan in the 1980’s and the US in the 1920’s: two prosperous creditor nations, two stock market bubbles. However, as Barron’s pointed out: the bears had been wrong for some time. For example, George Soros had been short Japan and even penned an op-ed in the Financial Times, days before the 1987 crash. He was badly bruised as the U.S. markets cracked first. We can observe how Jones implemented his bearish view of this runaway bull market. He would short the market on every break of 5%. That break represented a possibility of the top and he wanted to catch the first big decline. However, if the market recovered, he would cover his short. The market had consolidated in mid-1988, then shot up into January of 1989. Therefore, at the time of his comments, he was bearish but not short. The risk-reward expectation seems to have been: a loss of 4-5% on every false breakdown and a 25-35% gain when the market broke. Jones was willing to endure repeated small losses while waiting for the big payoff. Also, stock index futures began trading in Japan in September of 1988. Jones visited the country two weeks later and observed trading live at one of the brokerage houses. He remarked that dollar volumes had already eclipsed U.S. pre-crash volumes. Jones was wrong again in 1989. The Nikkei advanced all year and only declined into January of 1990. At the Barron’s Roundtable, Jones turned into a raging bear. At this point, Jones turned his attention to the institutional players in the Japanese market. He analyzed market sentiment, positioning, and institutional incentives. This allowed him to form a thesis of how the key players were likely to react if the market weakness continued. In May 1990, Jones met with Barron’s for a follow-up interview. He was up 30% for the year. When Barron’s called his prediction on Japan a home run, he humbly noted that he had made the same prediction in both 1988 and 1989. Jones described the Japanese top as a peak like “1929 or 1966” that would not be exceeded for another 25 years. In his view, the market had “a long way to go on the downside” and little “real liquidation” had taken place yet. Long-term stock charts tempt us to look at history in a simplistic way. 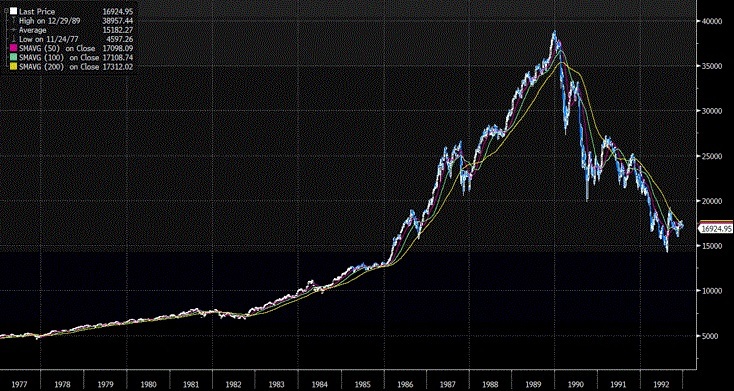 The crash of 1987 is followed by a steady recovery and, eventually, the roaring dot-com bull market. The 1990 bear market appears as barely a blip. Investing looks easy and straightforward in retrospect. We know it is important to think of the future in a probabilistic way, as a range of possible outcomes. But the same is true for the past. The path we see in a stock chart represents just one of multiple possible scenarios. Was another depression in the cards after the crash of 1987? When analyzing a decision-making process, I find it helpful to look at the historical context and try to empathize with the actors. What were the conditions of their situation? What information did they have to form their view? How did they weigh contradictory information? I hope I was able to shed some light on these questions and show how Paul Tudor Jones made decisions under uncertain and volatile conditions. His comments and behavior illustrate several trading principles and touch on interesting dichotomies. Jones developed a fundamental thesis and tested it. The crash of 1987 looked like the confirmation he had been waiting for. It makes sense to me that he retained a fundamentally bearish outlook after his narrative seemed to unfold perfectly at first. But he didn’t let that big idea keep him from entering short-term bullish positions when technical factors suggested it. When Jones’s fundamental view aligned with the technical picture, he was willing to bet big. However, when the U.S. market was oversold, or when sentiment was overly negative, he was tactically neutral or bullish. While the Japanese bull market was roaring, he patiently watched and waited for a break to enter. When the market rallied again, he would cover instead of letting the losses compound. Jones was a bear on Japan for years before the market crashed. Arguably, his risk management discipline was more important than his analysis of the bubble. Jones had a fundamental view, but he did not proclaim to know better than the market. He was open to new information. He didn’t complain about how irrational the market was. He just observed and waited for opportunity. If the U.S. market made new highs on strong volume, that meant that a new bull market was beginning. His job was to “go with the flow.” In the words of Jesse Livermore: “the only thing to do when a man is wrong is to be right by ceasing to be wrong.” It’s ok to be wrong, but not to stay wrong. John Templeton said the four most expensive words in the English language were "this time it’s different." But I think this episode illustrates how deceptive it can be to rely on a simple historical analogy. Some key factors will align and tell a compelling narrative of how everything will unfold. But confirmation bias will discount other, conflicting facts. I think it’s notable that Jones visited Japanese trading floors a couple of weeks after index futures started trading. He wanted to know the players. He wanted to have an intimate understanding of this marketplace. He watched the New Year’s ceremony at the Tokyo stock exchange and analyzed the portfolios and incentives of the major institutional players. All of this was part of a mosaic: he wanted to understand positioning, sentiment, and behavioral biases. I do wonder to what extent Jones’s public commentary affected his market views. It seems that he was aware of this potential pitfall. But being a vocal bear, or bull, year after year carries a danger that one wants to eventually be proven right. In a 1997 article, a market observer noted: “Time and again I’ve heard traders say, ‘You can always see Jones coming, but you can never see him going.’” That’s something to keep in mind when hearing Jones’s public opinion, such as his bearish call on bonds in early 2018. He may be a bear today, but he might already be going with the flow tomorrow.